Making a ballet tutu can be a very rewarding experience. To see your costumes on stage after a long process of creating them creates feelings of pride and accomplishment, following carefully sewing on hooks and eyes, and creating layers and layers for the finished product. For large scale companies and individual commissions the process is the same. For individual commissions, with perhaps one seamstress, it is a lot of hard work and long hours so they may only take on a few each season. For larger companies the work load is much heavier because of the all the programme demands and the dancers’ needs. The techniques to create tutus have mostly been in use since the 1800s; for many companies the bodices are made of cotton coutil, the same fabric used for corsets. This is extremely strong, but it is comfortable too and absorbs sweat. A tutu is a pancake style skirt that sticks out from the dancer’s body, originally designed to show off the dancer’s legs and intricate footwork. Generally there are ten rows of ruffles forming a tutu, some of which use multiple layers of net and tulle, and often the cost of individual commissions can rise to hundreds or thousands of pounds. These one-of-a-kind costumes are completely special to the customer but part of everyday life for designers and creators. Each tutu begins by making the knicker part, and from there the tutu itself is built and the bodice is constructed. For both aspiring and company dancers, the costume must be a perfect fit: the dancers often want them as tight as possible in order for them to feel more secure when performing. The tutus are designed to last a long time, enduring many performances, possibly many dancers and other wear and tear factors too. Performing on different stages also takes its toll however the costumes prevail. Whilst the stereotypical uniform for dance is much the same, different uniform is required for different dance schools, different exam boards and even different dance grades. For a non-dancer, the assumption of pink ballet tights and a leotard for ballet is not so far from the truth, the stereotypes also formed for tap and modern jazz. Contemporary and lyrical classes tend to be a little more free and liberal in terms of what the dancer dons, and can range from anything to short shorts and tights tops to tracksuit bottoms and baggy pyjama-style tops, known on the whole as ‘baggies’, often used in any dance class for warming up. Despite the stereotypes, dance teachers all employ certain uniform and dance wear standards for their students. Some prefer their dancers to be comfortable with what they are wearing, whereas others maintain that a dancewear uniform enforces discipline and technique as the teachers are able to see the dancers’ bodies easily. For those who like to see their dance school uniform worn, or neat dance wear purchased, their dancers are more likely to adhere to the standards required during dance exams too. Some dance examination boards define each grade through different coloured leotards, waist elastics or style of ballet shoe. Aside from ballet, jazz dance and modern jazz is also sometimes subject to requirements such as these. Some exam classes, or even individual teaches, will ask that no split sole jazz shoes be worn, for example, or alternatively that split sole jazz shoes are preferable. Some argue that split sole shoes – be it jazz, ballet, jazz trainers or even tap shoes – offer no support and a full sole provides more for the technique. However, dance shoes, like the rest of the catalogues and wardrobes full of dance wear, are usually dictated by teachers and dancers grow up with these views instilled. It is that time of year again, when summer school places are booked up and participants are eagerly waving their practice shoes and leg warmers, impatient for the summer holidays when they can either continue or intensify their training over the sunny weeks ahead. Whilst there are a great many summer courses, school workshops, classes and more on offer to the dedicated dance student, all require one thing: a checklist of dance shoes and practice clothes. As the largest and arguably leading dancewear retailer in the UK and Europe, Dance Direct knows its stuff when it to comes to affordable dancewear, stocking brands such as Bloch, Capezio, Pineapple, Plume, Dans-Ez and Sansha, amongst many more. 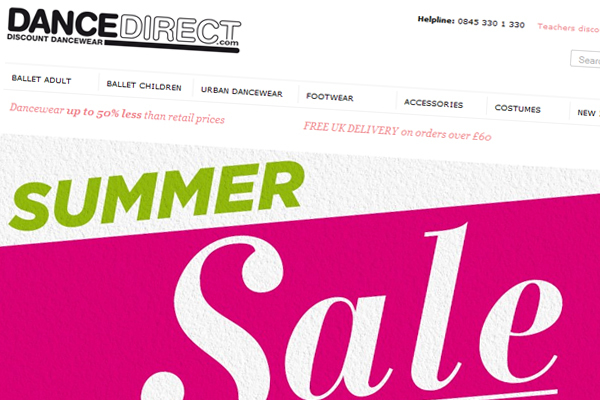 This is why the latest Dance Direct promotions are perfect for all your summery dancewear needs! New in are limited edition leotards, with some eye-catching pastel colours to get you through the sometimes eye-wateringly early ballet classes, and also some stylish black leotards – in particular a slinky one-shouldered design from Plume – to add a touch of class to jazz routines, or paired with tights and legwarmers for the old-school ’80s feel. If instead you are a dance teacher, rather than a student gearing up for the summer intensive programmes, Dance Direct are also offering dance teachers a discount programme of 40% off all costumes and up to 10% off branded dancewear ready for the end-of-programme summer shows, kitting out all the students. If your dance wardrobe is up to date, how about browsing the latest selection of bags, holdalls and accessories, all with applicable discounts? There are a variety of kits bags on offer, such as those from Pineapple and Capezio to suit all your dancing needs, and store those new purchases ready for your dancing holiday! There is, without a doubt, no better feeling than watching a ballerina glide across stage, carried by her pointe shoes. This illusion is just one that captivates audiences and brings them back for more. However, finding out how pointe shoes are made explains just how they work and how they provide that ‘effortless’ look. For example, Freed, a supplier of ballet and dance shoes since 1928, produces over 150,000 pairs each year, with much work going into each. Freed uses the “turnshoe” method which means that shoes are made from the inside and then turned out the right way around. There are approximately 250 workers across three locations, with 23 makers in total. Each maker has their own symbol which is stamped under the shoe, with the shoe’s shape affected by the shoe-maker. Some Freed shoes are custom made according to the client’s specifications, and some experienced shoe-makers take just 10 minutes to create a pair of pointe shoes, with around 400 shoes created overall each day. Aside from pointe shoes, other shoes which are made include ballroom, Latin, stage and screen, tap, jazz, character and soft shoes, the method hardly changing since 1930. Many dancers opt to customise their shoes themselves, such as by cutting the vamp into a V shape to make the shoe appear longer, and then sewn again to hold the shoe together. Elastics can also be sewn inside the shoe in order to add security, for the peace of mind of the dancer that their shoe is not going to slip from their heel. Dancers also work to remove the noise from their shoes, for example by shutting them in doors, hitting them against the floor, and so on, in order to achieve silence as they move around the stage. As ex-professional ballet dancers at Dance Direct, pointe shoes are carefully selected as essential elements of the young dancer’s dance journey. As foot strength and technique increases, young dancers are able to make the transition onto pointe and expand their dance capability. Stocked by Dance Direct are pointe shoes from brands Bloch, Capezio and Sansha, which are suitable for both beginners and advanced dancers alike. Each shoe and its design have their own specification which is extremely important, as each dancer is different, and requires different things in order for their pointe work to be successful. Each foot is different, and some shoes even require a little personalisation on the part of the dancer to make sure the shoe fits their foot perfectly. Many dancers, both professional and non-professional, have been known to cut, modify and completely renew their shoes, even in order to make them last longer. Specifically, Capezio’s shoes have been crafted to offer maximum support for balance and comfort. The top quarter of the shank is shaved so the sole follows the foot enhancing the instep on and off pointe, increasing fluidity of movement for the dancer. On the other hand, in Bloch’s revolutionary new pointe shoe the Axis comes with a TMT toe box and TMT shank. The Axis is a tapered shoe that looks delicate, light and beautiful en pointe. It is a quieter shoe with cushioned pleats to reduce noise, and it is built on a curve last. This new pointe shoe from Bloch is more suited towards professional and serious students. Finally, Sansha’s unique pointe shoes are designed for dancers at all levels of training: the shoe has a large platform and supportive shank for all kinds of work. To see our full range of pointe shoes visit this page: Dance Direct Pointe Shoes . Whilst there is much negative stigma about the dance experiences in Physical Education, dance within P.E. lessons has proven itself to be successful, not only encouraging students to take part, but also contributing to today’s dancewear scene. Many teenage girls who were perhaps unwilling to participate in sports have been seen to thoroughly engage in dance and consequently excel, in parallel to, for example, disruptive boys who have found their forte in the strength and skill of break dance during P.E. Many lessons also, for example, consist of street dance, appealing to students as they are able to express themselves through the up-to-date movement and their urban dance sneakers, tracksuit bottoms and the occasional sweatband, meaning dancewear has received more attention and popularity. The days of gym knickers are far behind us! Dancewear has evolved significantly, however early influences can be identified. Early ballet, dating as far back as the 1800s, saw courtly influences of much longer skirts than are seen today and satin ballet slippers for females. Similarities here as well as that of male tights and long-sleeved shirts demonstrate the loyalty dance has to its originators, and how practical the first instances of dance were. The mid-1800s saw choreographer of La Sylphide August Bournonville designing the ballet slippers for males that are still worn today with a V-shaped vamp to give the illusion of a long and pointed foot. The Romantic tutu also made an appearance, but under another name originally. Today, the traditional ballet style has been adopted and also brought into the fashion world, with ballet pumps and tutu style skirts echoing ballet’s origins. The 1890s saw the emergence of Jazz dance, and it became increasingly popular, taught in numerous dance studios. Costumes were experimented with, open to more adventurous design work and became more practical, highlighting the dancers’ lines in addition to looking effective and eye-catching, also mirrored in practice wear. In addition, Modern dance, now known as contemporary dance, developed as a result of Isadora Duncan’s rejection of the tight bodices of the tutus of classical ballet in favour of Greek-style tunics. She believed tight clothing was a restriction to the body’s natural movement and to this day we see this trend, especially clothes of the hip hop world and on television programmes such as So You Think You Can Dance. Dance Direct… Still the Exclusive Partner of Plume Dancewear! Dance Direct is still very proud to be the only supplier of Plume dancewear in the UK! Check out the pre-Christmas sale! The Victoria and Albert Museum’s major autumn 2012 exhibition, Hollywood Costume, is set to be a fabulous and incredibly insightful event. The landmark show will open after five years of sourcing and identifying items to be part of the treasure trove of exhibits. During the Golden Age of Hollywood (from the 1930s to 1950s), costumes would be removed to vast costume storage once the filming was complete and were subsequently rented, remade and re-styled for new productions, rather than maintain their significance for the original production they were intended for. When the Hollywood studio system declined in the 1960s and 1970s, costume archives were sold making the curator’s job for the V&A exhibition even more challenging. However, some iconic costumes have been tracked down for showcasing with even some private collectors loaning their treasures to the exhibition for the general public to see up close. The earliest costume in the exhibition is from the first MGM sound film, The Broadway Melody, which was released in 1929, winning the Academy Award for Best Picture and the film was followed by many successful sequels. The costume displayed was worn by Bessie Love as one of the Mahoney sisters as a vaudeville act, complete with character shoes and shiny show tights. The film A Broadway Melody was a huge catalyst for change in the film industry in the transition between silent films and sound. Another iconic costume on display is the gingham pinafore dress worn by Judy Garland as Dorothy Gale in The Wizard of Oz, having been held in a secure bank vault in London’s Fleet Street. One of the pairs of Dorothy’s sparkling ruby slippers are in demand for the exhibition, having taken on mythic status since 1970 when MGM sold a pair for $15,000, and it is unclear how many shoes remain in existence. Other costumes which will be creating the sum of the V&A exhibition include those from Vertigo (1958), The Birds (1963), the mink and sequined dress designed for toe-tapping Ginger Rogers in Lady in the Dark (1944), Hello Dolly! (1969), Saturday Night Fever (1977) and Moulin Rouge! (2001), along with the musical Chicago complete with stylised black costumes, such as Renée Zellweger’s floor-length gown for her performance of Nowadays. For more information about this exhibition, visit the V&A website. Image courtesy of the Victoria & Albert Museum.